Rim of the World Unified School District covers 110 forested square miles within the boundaries of the San Bernardino National Forest overlooking the Inland Empire Valley. With Los Angeles approximately 90 miles to the west and San Bernardino 20 miles to the south, the district services the communities of Crestline, Lake Arrowhead, Running Springs and numerous small communities in between. Approximately 630 certificated and classified dedicated employees serve on behalf of 5,700 students. With five elementary schools, one intermediate school, one traditional high school, one continuation high school and Alpine Adult school the district provides unexcelled education to our mountain area students. Six out of the eight schools have been named California Distinguished Schools, and Mountain Continuation High School is classified as a California Model School! To reach the Rim of the World School District office, you may call (909) 336-4100. 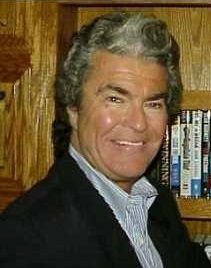 Charles Hoffman Elementary (CHE) School was named in honor of Charles “Chuck” Hoffman, principal of the school for 25 years. The school is located in the heart of the San Bernardino Mountains in the community of Running Springs. This resort community is centrally located between Big Bear Lake and Lake Arrowhead . Charles Hoffman Elementary is a public school with grades K-6 with an enrollment of approximately 575 students. CHE believes in a student-centered approach, which provides an atmosphere in which a child’s social, emotional, and intellectual needs are equally important. All students have special talents and are given the opportunity to develop those talents. Home of the Mountain Lion Cubs. 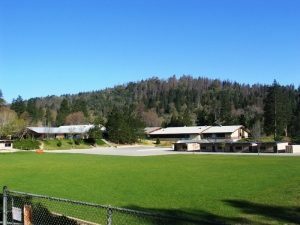 Lake Arrowhead Elementary (LAE) School is nestled in a magnificent forest of pine, cedar, and dogwood at an altitude of 5,100 feet in the resort community of Lake Arrowhead , California . LAE is a public school, grades K-6, with an enrollment of approximately 790 students. In 1997 LAE was recognized as a California Distinguished School. In 1998-1999 LAE was the recipient of the Exemplary Reading Program awarded by the International Reading Association. Only one school in the state of California received this award, Lake Arrowhead Elementary. LAE staff believes each child is unique and deserving of a rich educational environment. Each student has access to a rigorous core curriculum in language arts, mathematics, science, and social science. The hard working staff is both skilled and dedicated to the success of their students. LAE is fortunate to have many experienced and knowledgeable teachers eager to make a difference for their students. LAE believes in a student-centered approach, which provides an atmosphere in which a child’s social, emotional, and intellectual needs are equally important. All students have special talents and are given the opportunity to develop those talents. 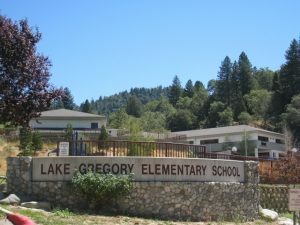 Lake Gregory Elementary (LGE) is nestled on the shore of Lake Gregory in the community of Crestline, high atop the San Bernardino Mountain range. 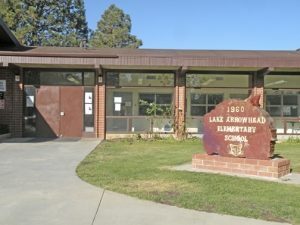 LGE opened its doors in 1997, hosting 4th thru 6th grades, joining five other elementary schools in the Rim of the World School District. Through the diverse, rigorous and enriching curriculum, LGE prepares students to become life-long learners and positive members of society. To assure success in this vision LGE follows the Team Husky approach. The collaborative effort between the school community and the local community ensures all students will excel. The seasoned, well-trained teaching staff has over 200 years of experience with over half of the staff earning advanced degrees. Each LGE teacher serves on several district-wide curriculum committees, where representatives from all schools in and grade levels meet to plan, develop, train and institute a balanced comprehensive standards-aligned curriculum. LGE assists in student needs and transitions by articulation with the feeder sister K-3 school VOE, located in neighboring Valley of Enchantment. Valley of Enchantment Elementary (VOE) School is located in the small mountain resort community of Crestline, approximately 15 miles northeast of San Bernardino . A portion of the school site is known as the Enchanted Forest Nature Center and has been set aside to provide an environment for the study of earth sciences and ecology. VOE is a public school serving grades K-3 with an enrollment of approximately 500 students. In 2002 Valley of Enchantment was recognized as a California Distinguished School . Valley of Enchantment staff believes each child is unique and deserving of a rich educational environment. Each student has access to a rigorous core curriculum in language arts, mathematics, science, and social science. The hard working staff is both skilled and dedicated to the success of students. VOE is fortunate to have many experienced and knowledgeable teachers eager to make a difference for their students. VOE believes in a student-centered approach, which provides an atmosphere in which a child’s social, emotional, and intellectual needs are equally important. All students have special talents and are given the opportunities to develop these talents. 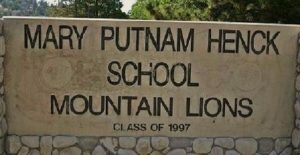 Mary Putnam Henck Intermediate School (MPH) is located in beautiful Lake Arrowhead and is named after Mary Putnam Henck (1882-1963). She was the first teacher in Lake Arrowhead that formed the current school district. MPH opened in 1970 and remains the only intermediate school in the Rim of the World Unified School District . MPH School presently serves approximately 1,000 seventh and eighth graders from twenty-two mountain communities within the district. MPH is a 1999 California Distinguished School . The MPH staff believes each child is unique and deserving of a rich educational environment. Each student has access to a rigorous core curriculum in language arts, mathematics, science, and social science. Additionally, all students take physical education and two elective classes each year. The hard working staff is both skilled and dedicated to the success of their students. MPH is fortunate to have many experienced and knowledgeable teachers eager to make a difference. MPH believes in a student-centered approach, which provides an atmosphere in which a child’s social, emotional, and intellectual needs are equally important. All students have special talents and are given the opportunity to develop those talents. Rim of the World High School is located in the heart of the San Bernardino Mountains in the beautiful resort community of Lake Arrowhead . 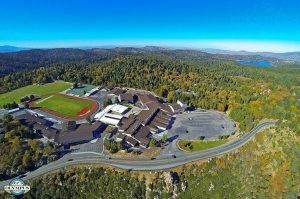 Rim of the World High School is the only high school in the area and serves the entire mountain from Crestline to Running Springs, including all surrounding communities. The comprehensive, coeducational public school serves between 1750 and 1850 students in grades 9-12. RHS is a 1999 California Distinguished School . Also in that year, the Western Association of Schools and Colleges (WASC) and the California Department of Education examined Rim of the World High School . Twelve areas of strength were recognized, qualifying RHS for a full six-year term of accreditation. RHS staff believes each child is unique and deserving of a rich educational environment. Each student has access to a rigorous core curriculum in language arts, mathematics, science, and social science. The RHS staff is both skilled and dedicated to the success of the students. RHS is fortunate to have many experienced and knowledgeable teachers eager to make a difference. Mountain High School is a continuation school located in Crestline , California . A ponderosa pine and oak forest creates a beautiful atmosphere for this school setting. Mountain High is part of the Rim of the World Unified School District, which is comprised of three major mountain resort communities and several satellite communities. Mountain High Continuation School is housed in the Mary Tone Education Center , which is also the site for Independent Study and the Community Day School . Each day the school serves between 140 and 150 students. MHS staff believes each child is unique and deserving of a rich educational environment. Located between RHS & District BusYard. Please call the above number for more information.